Adrian has been using all different types of tongs (buy here) since about two years of age, and at a three-year mark, he has mastered them all except for chop-sticks. So, to keep the interest alive, I change the setup frequently and offer a "new" and aesthetically enticing presentation. For this Fall-Halloween inspired transferring, I am using Autumn Leaves and Halloween Boo ice trays and various tongs. Transferring with tongs is a great fine and gross motor exercise since some smaller tongs require precision while the larger ones will definitely engage larger muscles in the hand and fingers. These Halloween styrofoam covered balls are light and perfect for transferring with large tongs. With the same ice-tray, I offered smaller glittering orange styrofoam balls and new tongs. 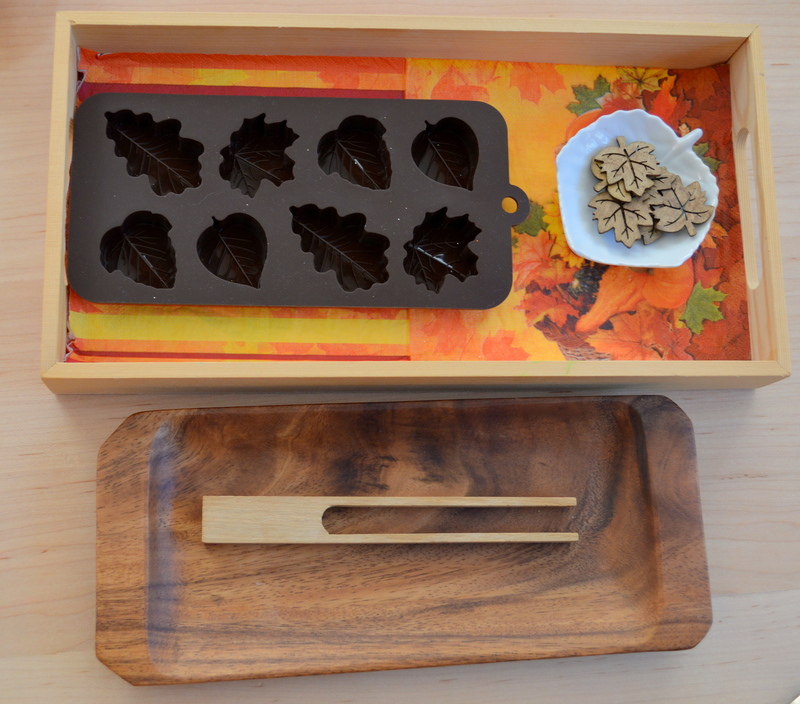 Autumn leaves tray, acorns as transferring objects, and small one-piece bamboo tongs. Lastly, I offered wooden maple leaves as transferring objects and a larger solid oak tongs. Adrian is holding tongs the same way he would correctly hold a pen or a pencil. The “pincer grip” is a common term among elementary school educators, therapists, and doctors, which means the grasp used by the index finger and thumb to pinch or pick something up like the first finger food, or a blueberry, or a shoelace, and eventually a pencil. On the other hand, the correct "pencil grip" involves holding the pencil between the thumb and pointer finger, and resting the pencil on the middle finger for added stability. Squeezing tongs to maintain the pressure indeed puts those little muscles to work, helping develop a precise pencil grip. Practical life activities fall into six main categories. One of them is teaching a child fundamental skills such as transferring by pouring, spooning, and then tonging in a sequential order where each lesson builds upon the last one. The "sensitive period" for transferring starts at about two years of age and slowly begins to fade as the child masters the skill. Since every child develops at his/her own pace, some might start losing interest as they approach three-year mark, and others later. Coincidentally, at three-years-old, a child enters a new sub-stage of the First Plane of Development: what Dr. Maria Montessori called a "conscious absorbent mind." “It is as if the child, having absorbed the world by an unconscious kind of intelligence, now ‘lays his hands’ to it.” Now it is the hand as a ‘prehensile organ of the mind,’ not just the senses, which move the child through a period of constructive ‘perfectionment’ – refining the acquisitions already made. Dr. Maria Montessori. So, my advice is to start early: at around two years of age and keep changing the presentation to keep the interest alive. What transferring activities do you offer your child? Have you experienced a diminished interest with a certain age? For more on Autumn-themed activities, read here a roundup of all our activities we have done during the month of 🍂September and 🎃October: over 20 of them! arranged by the area of study in a post "🍂Fall & 🎃Halloween Inspired Homeschooling 101 Unit Study."